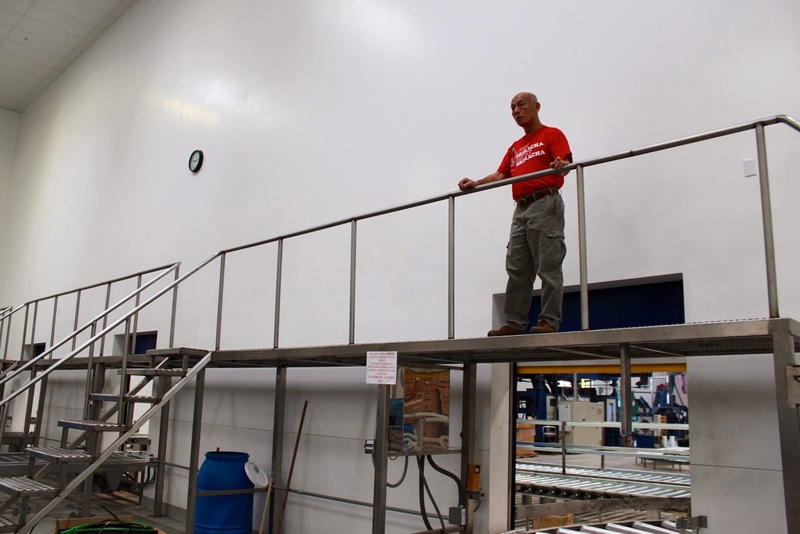 David Tran, CEO of Huy Fong Foods, looks over the production line. Photo by Randy Clemens. On the coattails of success of the L.A. Sriracha Festival the Los Angeles Times reports that residents of Irwindale near the new Huy Fong Foods factory have lodged complaints about headaches and burning eyes, which they allege are the result of the emissions coming from the hot sauce production facility. Jalapeños loading to get washed and ground. Photo by Randy Clemens. "The smell is so aggressive that one family was forced to move a birthday party indoors after the spicy odor descended on the festivities, said Irwindale City Atty. Fred Galante." 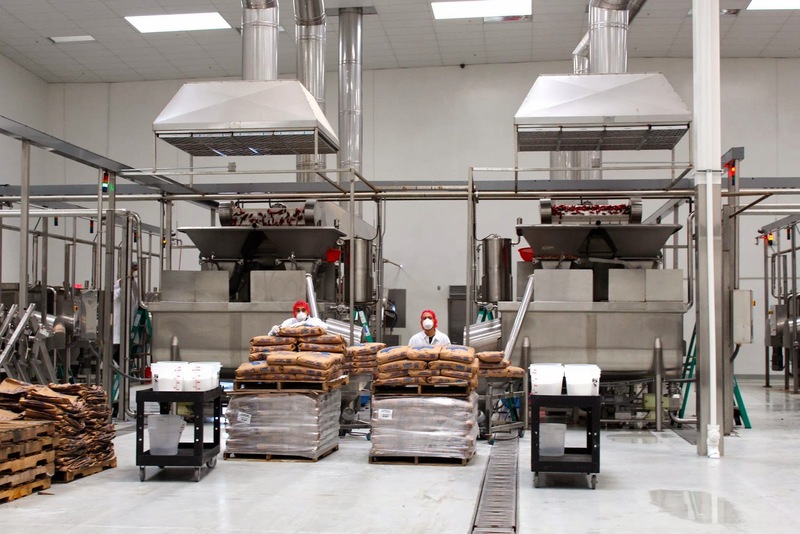 "I’m hopeful that it doesn’t halt Sriracha production or cause any delays. 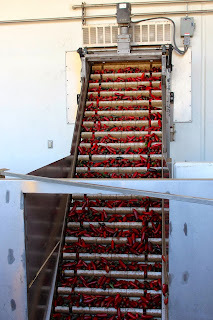 Huy Fong Foods relies on fresh chiles for its Sriracha—100 million pounds’ worth this year—which are all grown by Underwood Family Farms. They are trucked directly to Huy Fong Foods from the farm, and are washed, processed, and turned into hot sauce immediately, at the peak of their freshness. 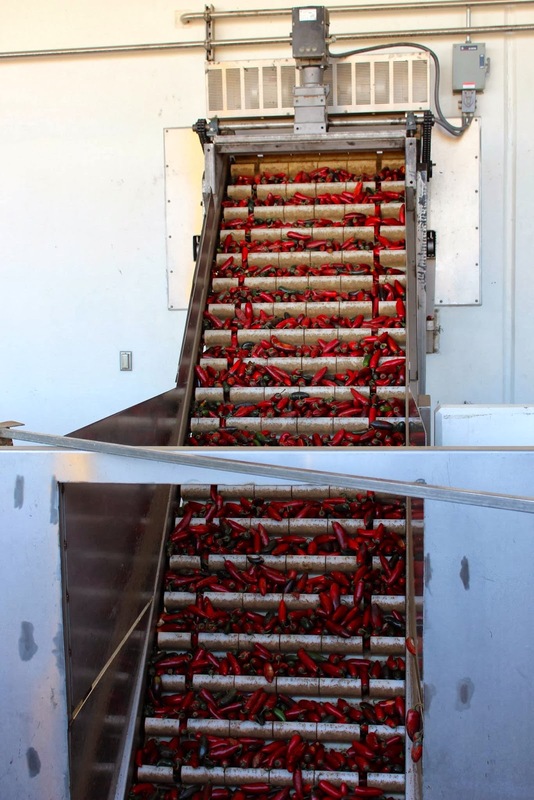 Harvest season for their jalapeño hybrid peppers is almost over, but they still have plenty more deliveries scheduled which will help ensure supply for next year. An action by the court could cut into that supply." Get the full skinny at the L.A. Times website! It's Boorito time! This Halloween, Thursday October 31st, Chipotle brings back the long-standing tradition of treating any customer dressed in costume to a yummy yummy burrito, bowl, salad or order of tacos for only $3 from 4 p.m. to closing. Proceeds from the fundraiser of $1 million will benefit the Chipotle Cultivate Foundation. Proceeds from Boorito, $1 million, will benefit the Cultivate Foundation, a non-profit organization committed to creating a more sustainable and healthful food supply and to raising awareness of food issues. The foundation supports family farmers and their communities, educators and programs that teach younger generations about food matters, along with support for ranchers and farmers who are working to develop more sustainable practices. Participation in Boorito is simple. 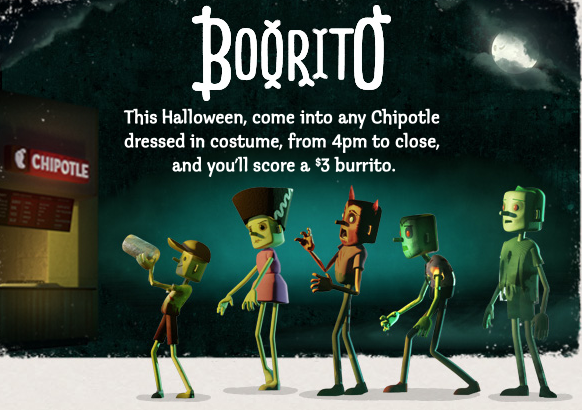 Go to any Chipotle restaurant in the US, UK, and Canada between 4 p.m. and closing on October 31st dressed in costume, any costume (the year I heard about this my friend was going to wrap his hand in tinfoil as a hand burrito), and purchase any Chipotle menu item for only $3. All that and a $3 Burrito! The Garden School Foundation's Harvest Moon party is this Sunday on October 27th!!! For those unfamiliar with it, since 2003 The Garden School Foundation has been dedicated to providing an interdisciplinary program of education through garden-based learning in outdoor living classrooms. They're absolutely awesome! And every year they have an awesome awesome fundraiser the Harvest Moon party that's full of rocking food and a super kickass silent auction (just disregard the bit where we actually just celebrated the Hunter Moon last week)! 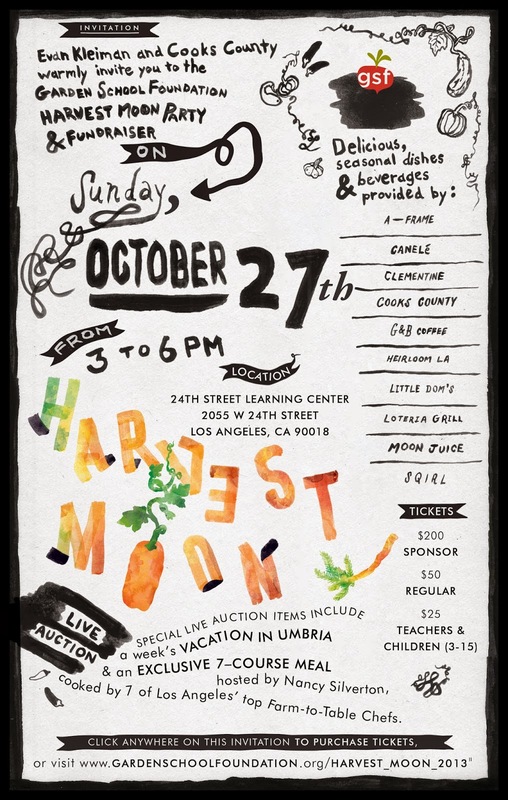 This year Evan Kleiman and Cooks County invite you to join them for a glorious autumn afternoon at the 1-acre 24th Street gardens in support of the Garden School Foundation's efforts to make garden-based learning available to every child in Los Angeles County. So check the Harvest Moon party out on Sunday and enjoy live music, win something special at the live auction, complete a garden scavenger hunt to win a prize, and taste specially crafted dishes and drinks from some of LA's best restaurants. Banksy's 'Sirens of the Lambs' Approaches the Factory Farming Issue with Puppets! Leave it to elusive British artist Banksy to increase the dialogue on factory farming in an ironically cute postmodern way! Premiering on October 11th, the Sirens of the Lambs is moving puppet sculpture that will be driving up and down the streets of New York, especially in the Meatpacking District, for the next two weeks! 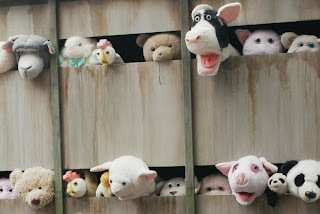 Housed in a slaughterhouse delivery truck, the animals' faces are Muppet adorable, but the truck emits loud squeaky screaming noises that indicates the creatures are in en route to their imminent doom. According to an audio guide on Banksy's website, the animals' heads are controlled by a team of mime artists inside the vehicle. The guide jokes: "This is a piece of sculpture art, and I know what you're thinking: isn't it a subtle?" He continues, that it is either "making some sort of comment on the casual cruelty of the food industry" or forging "an attempt at something vague and pretentious about the loss of childhood innocence." "The truck contains over 60 cuddly soft toys on the road to a swift death. However, in order to bring them to life, four professional puppeteers are required, strapped into bucket seats, dressed entirely in black lycra, pulling on an array of levers with each limb and given only one toilet break a day; proving that the only sentient beings held in lower esteem than livestock are mime artists." On the flip side, Banksy also announced yesterday he set up an art stall Central Park this weekend manned by an octogenarian. Banksy's works normally sell for hundreds of thousands of dollars, but these signed pieces were priced at $60 a pop. Banksy said on his website it took about four hours for the elderly man to have his first sale. He also noted, "this was a one off. The stall will not be there again today." Ben Franklin once said, "Beer is proof God loves us." 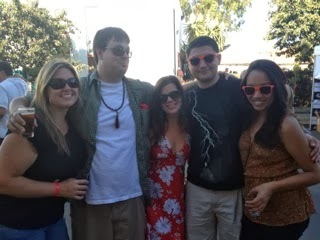 The attendees of the 4th annual Beer Art Music Festival (BAM Fest) couldn't agree more. Sponsored by the eclectic 8th Street Art Center in Santa Monica, this years BAM hosted over 40 plus local and domestic Microbrews, as well as toe-tapping music and innovative art. While all the brews at the event were frothy and delicious, there were a few undoubtable standouts! 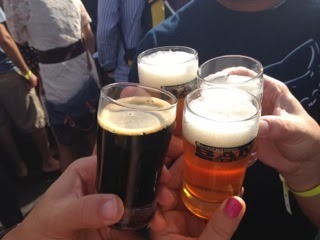 Among the favorites was Los Angeles's Eastside Golden Road Brewing. With crisp and bold brews these craft beers have gone from the best kept hipster secret to now gracing the aisles of Whole Foods across the city. Beers poured included their Point the Way IPA, Golden Road Hefeweizen, Burning Bush Smoked IPA, Golden Road Berliner Weisse, and their Opuntiale, a Honey Blonde beer brewed with prickly pear fruit, cactus honey, and mesquite-smoked cactus paddles (aka Nopales). Another unique brew included Monkfish Belgian Style Tripel Ale from Fish Brewing Company with subtle notes of vanilla and pistachio. Dogfish Head, a well-respected label from Delaware, which was featured in the Eye-opening documentary Beer Wars, filled the seasonal spot with a spicy and warm Pumpkin Ale. San Diego's Ballast Point was also in attendance with their unapologetic Big Eye IPA and Longfin Lager. Some other labels included Angel City (a local Los Angeles Downtown brewery who recently made a splash with their Avocado Ale), Cismontane, Sierra Nevada, Duvel, Stone, Smog City and more. While good brew and beautiful So Cal weather took the main stage, the festival also featured art by Cheryl Walker and Yvette Gellis, among others. And what's a day of drinking without music? Bands like Cory Phillips and the Groove Orchestra, Ben Bateman, and a few others provide the perfect tunes to enjoy hoppy beverages. The 18th Street Art Center also features festivals like Crush, a sampling of some of the best local and regional wineries and restaurants in the area has to offer. If the 18th Street Arts Center hasn't been on your radar stay posted, this small artist-inspired organization puts together the perfect spread the city's best drinks, culinary creation, art and music, all in a one stop, for one price gathering under the beautiful Santa Monica sunshine. Happy Belated National Honey Month! Happy Belated National Honey Month! Sure you might not have known there was a National Honey Month, but there is, and we missed since it was September! (Along with a Candy Month (June), National Celery Month (March), and National Be Kind to Servers Month (January)! So even though we're a week late, Happy National Honey Month! Called “the nectar of the Gods” by ancient Greeks, honey is the only food source produced by an insect that humans eat. Humans have been hunting the golden nectar for at least 8,000 years, as evidenced by the Spider Cave paintings in Valencia, Spain that shows honey-hunters using a ladder to collect honey and honeycombs from a wild bee nest. An ancient dangerous parkour-ian act yes, but totally understandable considering the Auh-Mazing variety of things that honey can do. Along with all its tasty deliciousness, honey is also an excellent skin beauty product ingredient. It has anti-bacterial properties that are fantastic at fighting off skin impurities (such as pimples and acne) and moisturizing dry skin (such as chapped lips and sunburn). You can also help eliminate scars by smoothing raw honey on them before you go to bed and covering it with a bandage. In terms of medicinal properties honey is the wunderkind of natural foods. It can be used as a holistic cough soother and allergy remedy by allowing you to build up an immunity to seasonal allergies. Historians have said almost all Egyptian medicines contained pure honey. Note the use of the word pure in the last sentence. Besides being delicious, honey is pretty much the only food that does not spoil while in an edible state, which why you should always buy raw honey. 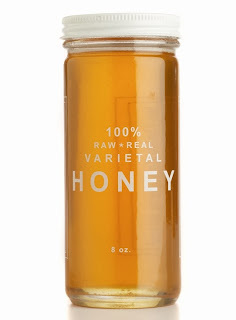 A lot of honey found in the supermarket is not pure raw honey but "commercial" regular honey, some of which has been pasteurized (heated at 140 degrees Fahrenheit or more, followed by rapid cooling) for easy filtering and bottling so that it looks cleaner, smoother, and more appealing on the shelf for those who want their honey to look and taste like tap water. On the flip side, raw honey is never strained, filtered or heated. Research suggests it’s loaded with many trace minerals, organic enzymes, antioxidants, plus antibacterial and anti-fungal properties that make it a powerful package of health. Its rich origins also mean that it’s loaded with more interesting tastes and flavors. 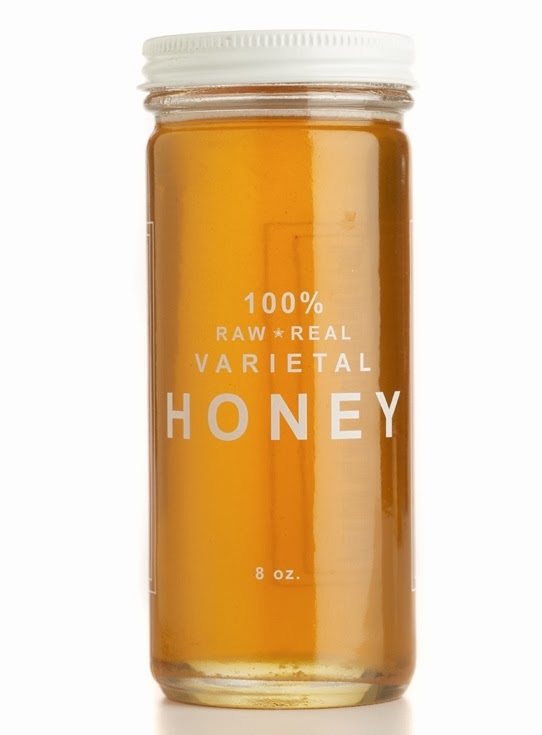 So if you're looking for the aforementioned Auh-Mazing honey properties, you'll need to get a raw honey such as Bee Raw, an American artisanal honey company. With 12 different raw honey varietals including Buckwheat, Meadowfoam, and Sourwood Bee Raw's tastes are the bee-bomb-diggity. Their Aster Honey is an light amber honey made from the blooms of numerous species of late summer Aster flowers. With their apiary (also known as a bee yard) located in New York, the taste is very herbal pallet with notes of Thyme and Eucalyptus. Bees are responsible for pollinating one in every three bites of food we consume. Sadly, because of pesticides, parasites and malnutrition, bees are dying off in huge numbers, thus jeopardizing the production of food that sustains human life. Honeykeepers have estimated that nearly one-third of all honey bee colonies in the country have vanished. If you want to do your part, Bee Raw Founder Zeke Freeman started the Save the Bees Fund, in order to help protect American honeybees from Colony Collapse Disorder. Because in the end, we'd all like to celebrate National Honey Month next year, on time! Edible Skinny Welcomes Our New Los Angeles Correspondent Kelly Grace Thomas! 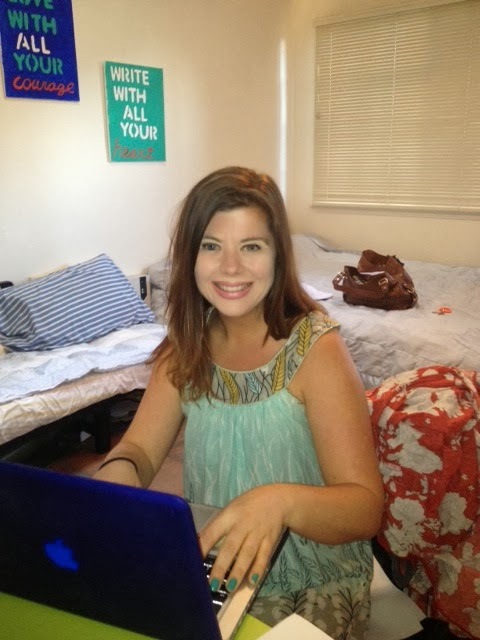 The Edible Skinny welcomes our new Los Angeles correspondent, Kelly Grace Thomas. Before for joining the ES Crew, Thomas worked as a journalist for the San Diego Community Newspaper Group. After three years in the field, she decided to make the move to education. Besides teaching high school English and coaching poetry, Thomas also works as a writer. She has just completed her first novel, The Travis Bannister Conflict, co-penned the screenplay Magic Little Pills and written an original television pilot, titled Watts Academy, about inner-city education. Thomas also writes a poetry blog called the Poetic Promise. Hello Fair readers After three years we've moved to the Google Blog Platform Blogger! Hooray!!! All new posts (and recovered older posts) will be (are) posted here! Please note that ES's new blog URL is http://edibleskinny.blogspot.com/, but if you just use our normal web address of edibleskinny.comhttp://www.edibleskinny.com/ you will automatically be redirected! 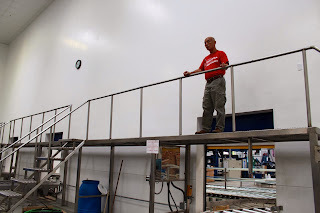 We are very very excited to move onward and upward in the world of Blogging! Can't wait to explore, learn, and taste edible adventures with all of you!! !